If you have been injured in a slip & fall accident, you may be suffering from more than just pain and discomfort. Often, those who have been injured as a result of a slip and fall accident have also missed work and have had to take unpaid leave. As bills pile up, how are you supposed to pay? The slip and fall lawyers at Giordano, DelCollo, Werb & Gagne, LLC have been helping accident victims in Delaware get compensated for pain and suffering due to another’s negligence. It is important that negligent businesses and property owners are held accountable if someone should slip and fall as a result of a known hazard or spilled liquid. 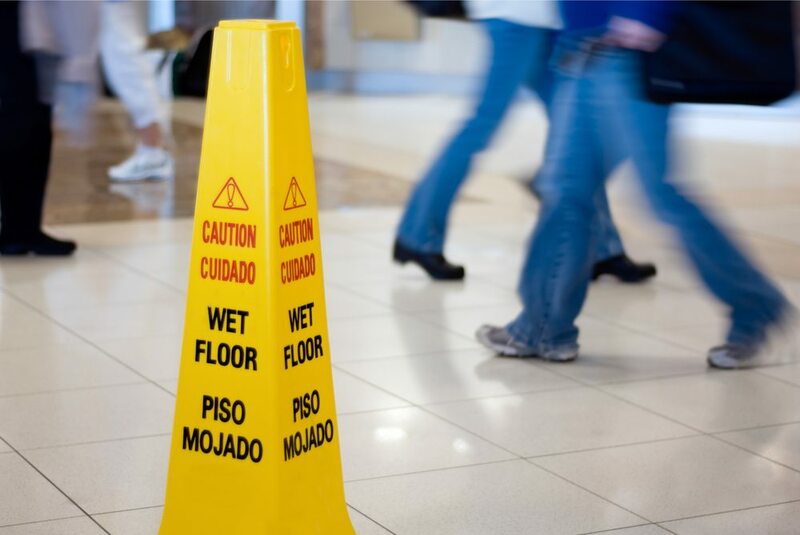 The laws regarding slip and fall injuries generally state that property owners and store staff have a reasonable amount of time and must make a reasonable effort to prevent against folks slipping on spilled liquid, ice or snow, for example. The law also states that the court take into account if the actions of the victim were the actions of a “reasonable person”. This is to say that if an area of spilled liquid or a patch of ice could be avoided by a reasonable person, chances are the injured party may have difficulty suing for damages. However, if carelessness or negligence is evident and can be proved, you have the right to seek compensation. The laws and regulations relating to retail stores and supermarkets versus private homeowners are different. Retail stores and supermarkets need to take reasonable steps to prevent against slip and fall accidents. For instance, areas where there may be spills or wetness from the misting of produce or watering of flowers must see mats laid down and caution signage deployed. Private property and homeowners usually face different regulations related to cracks in walkways and the salting of sidewalks or removal of snow. Often these cases are governed by local ordinances regarding the time in which homeowners have to clear walkways after a storm has passed, for instance. If you have suffered an injury as a result of a slip and fall accident at a store, construction site or private property and think you may have a case to sue for compensation for medical bills and damages associated with pain and suffering, we invite you to call the offices of Giordano, DelCollo, Werb & Gagne, LLC to schedule an appointment for a free consultation. If you have a case, we will do whatever it takes to negotiate a settlement or litigate in a Delaware court of law so that you can get fair compensation for your injuries.